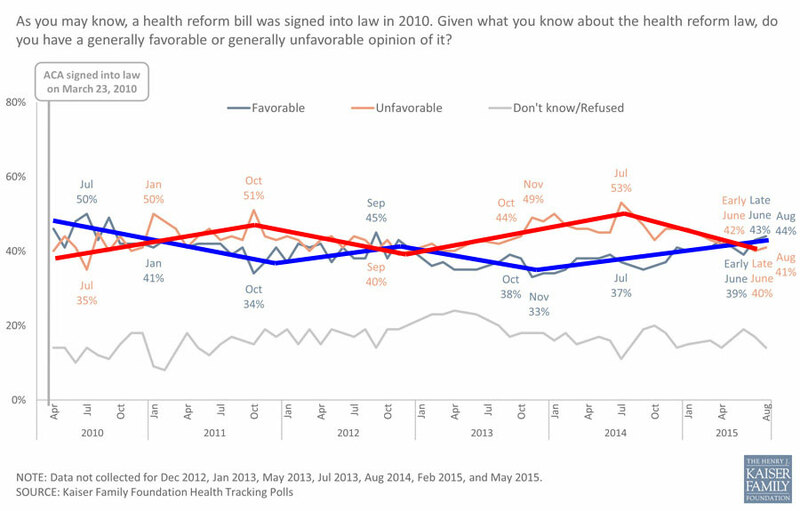 The trend is unmistakable: 45% of the public now support the ACA while only 41% oppose it. Public Policy Polling surveyed 1,338 registered voters between October 1st and 4th. The margin of error for the survey is +/-2.7%. 80% of participants responded via the phone, while 20% of respondents who did not have landlines conducted the survey over the internet. Both polls tell the same story: A slight plurality of both the public at large and registered voters specifically now support the ACA. The risk (politically) to the Democratic Party would be if registered voters were still opposing the law. If that had been the case, it would mean that a disproportionate amount of KFF's "45% 41% support" results would be coming from non-registered voters, thus masking the true opposition from those who actually might vote. The fact that both trendlines seem to be pretty much in line with each other is positive news for supporters of both the ACA itself as well as Democratic candidates in general. It's also important, as always, to remember that a chunk of opposition to the Affordable Care Act--perhaps 10-15% of the total--has consistently come from people who oppose it from the left. That is to say, many devout Single Payer advocates (basically, many Bernie Sanders supporters, although that's too much of a generalization) oppose the ACA because they don't think it goes nearly far enough. How will this impact the 2016 election? Well, if things stay as they are today, it probably won't impact it one way or the other. After several election cycles in which the ACA was damaging to the Democratic Party politically, it has finally been effectively neutralized, which is a positive for the Dems in & of itself. If the 2016 Open Enrollment Period is successful, however (ie, decent increase in enrollment, no serious technical screw-ups and effective premiums/deductibles which don't shoot up too dramatically), it could end up finally becoming a net positive for Democratic candidates in many races. UPDATE: OY!! I screwed up in reading KFF's September poll results; the numbers flipped between August and September, with 45% now opposing the law and 41% supporting it. If that trend were to continue, then yeah, it would be a problem...but again, it's still within the MoE, so it might just be noise. The worst-case scenario still appears to be the ACA being basically a neutral/non-issue one way or the other next year...except, of course, for the fact that every Republican candidate is still claiming a "repeal Obamacare!" stance, which will, by that point, have upwards of 35 million or more people on policies specifically enabled by the law (including the ACA exchanges, off-exchange policies with ACA-mandated coverage, Medicaid expansion and so forth).